I have to start off by saying that this is a tough post to write, not because of my performance on the day but because despite all my training and all my preparation for this event it was not the outcome I had planned. 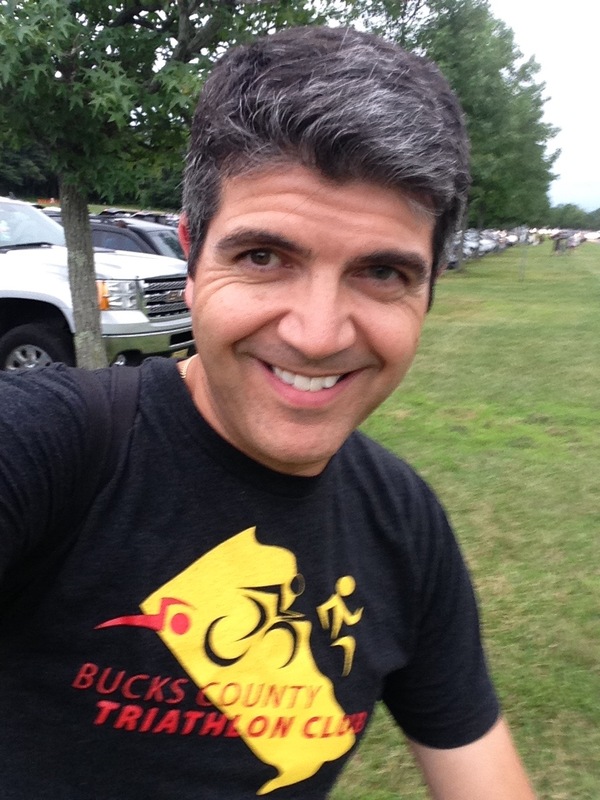 I was coming to the end of the bike portion of the race when I was called off my bike by a volunteer about half a mile from the transition to tell me that due to a report of a lightning strike on the course, the race was cancelled for the safety of the competitors. 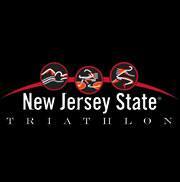 Back in October last year I signed up for the New Jersey State Triathlon. This was to be my first triathlon. I originally signed up for the Olympic distance (1,500 meter swim/23 mile bike/6.2 mile run) but having not worked as hard in the pool as I really needed to I decided to pull back to the Sprint distance (500 meter swim/11.5 mile bike/3.1 mile run) so I knew I would be able to finish. It was the swim leg that really had me worried. I was confident about the bike and run sections having done three duathlons in the last few years. After having joined a swim club back in October but going pretty rarely due to business travel and the access to the pool over the winter being limited I joined up with a pool closer to my house and committed to going 2 to 3 times a week and swimming. I kept up that commitment and have logged a number of long (for me) swim sessions over the last 2 months to give me the confidence that a) I wouldn’t drown, and b) I had enough in me to complete the Sprint distance. 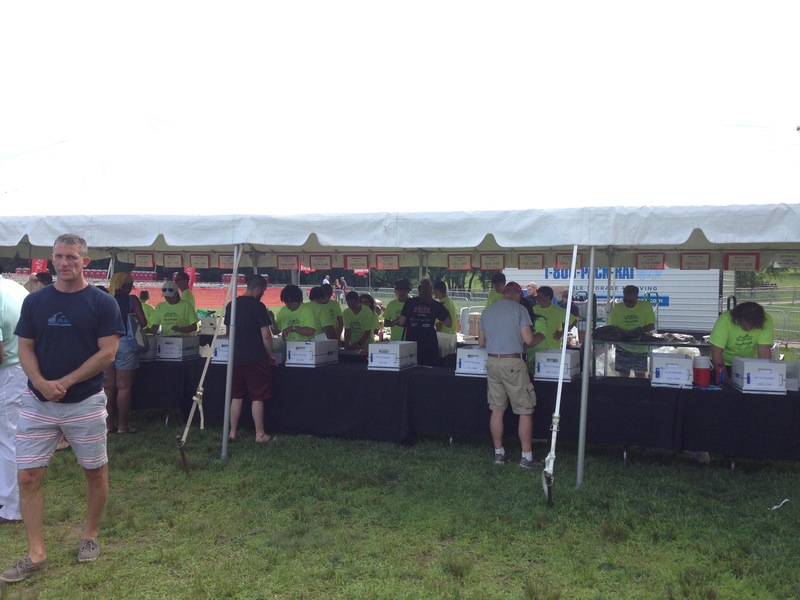 The day before the race arrived and I left work a little early to head over to Mercer County Park for packet pickup. 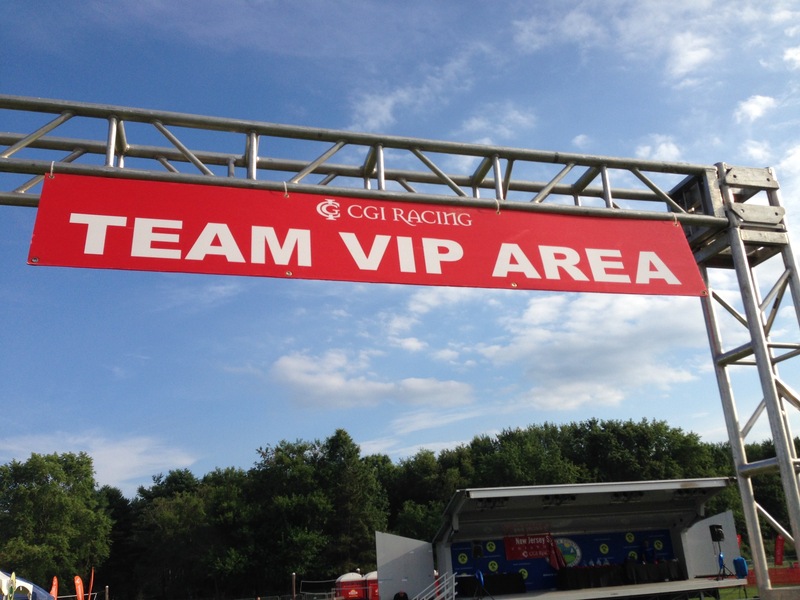 The race was being put on by CGI Racing which have put on a couple of other races I have participated in over the last couple of years, namely the LOVE Run Half Marathon and the Rutgers UNITE Half Marathon, both of which were very well run. 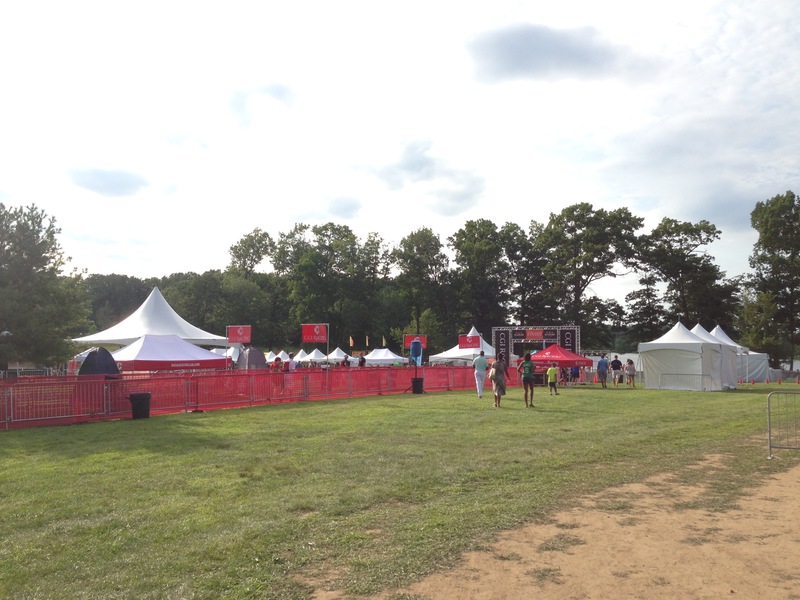 My goal when I got to the park was to pick up my race packet, ask a couple of questions that I had and then look at any expo they had (never having been to a triathlon expo). 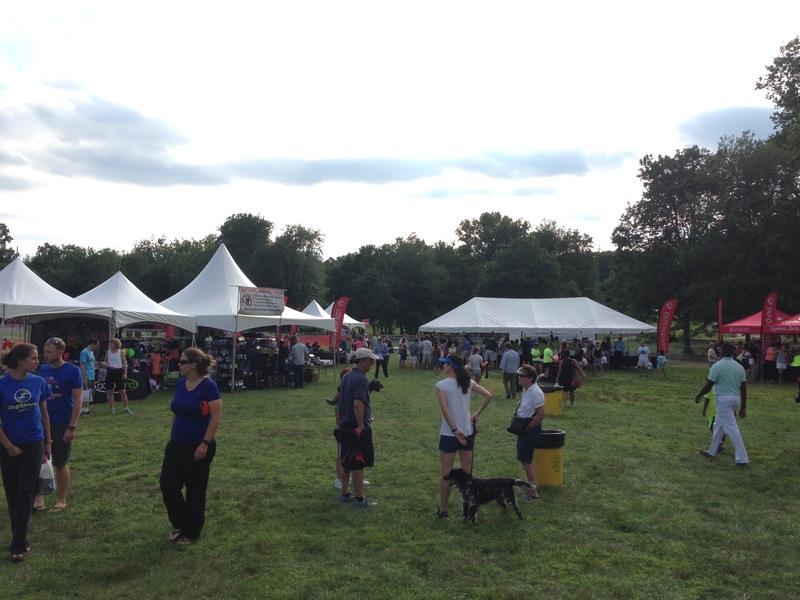 Packet pickup was in an open field by the transition area as was the expo. It didn’t take too long to pick up the packet and then the race shirt. I then went over to the information table to ask my couple of questions. 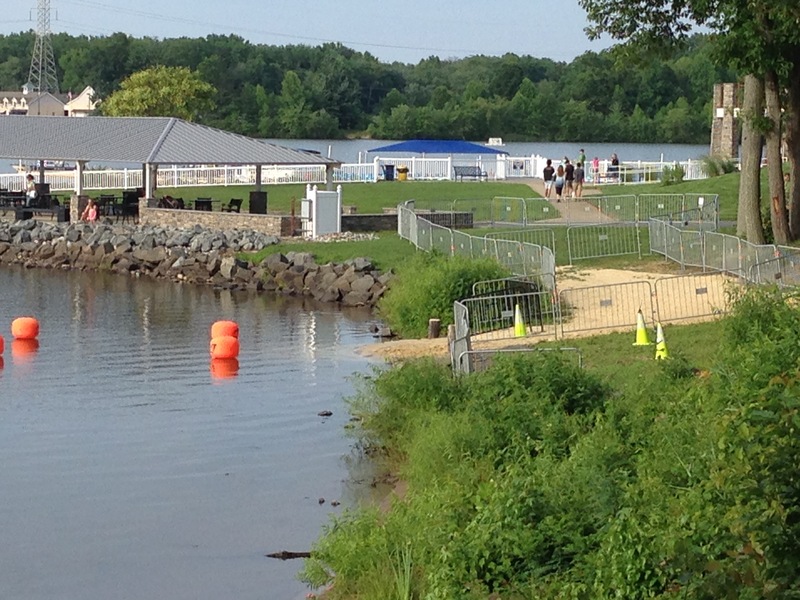 A volunteer recommended I walk the transition area to get familiar with the swim entry/exit before the race. I hadn’t thought about that but it was a great idea. It also helped calm my nerves a little to see what I would be getting myself in for. 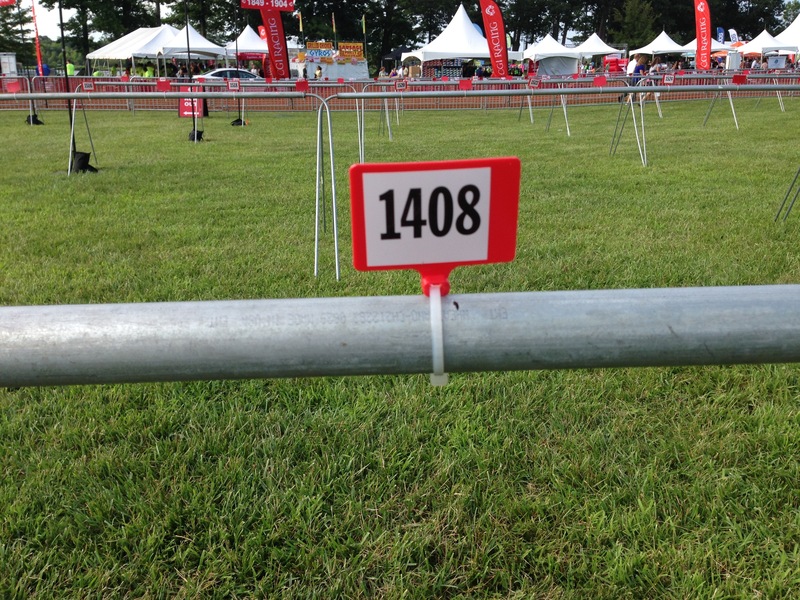 There was an information booth and an area to look up your bib number if you didn’t have it with you. 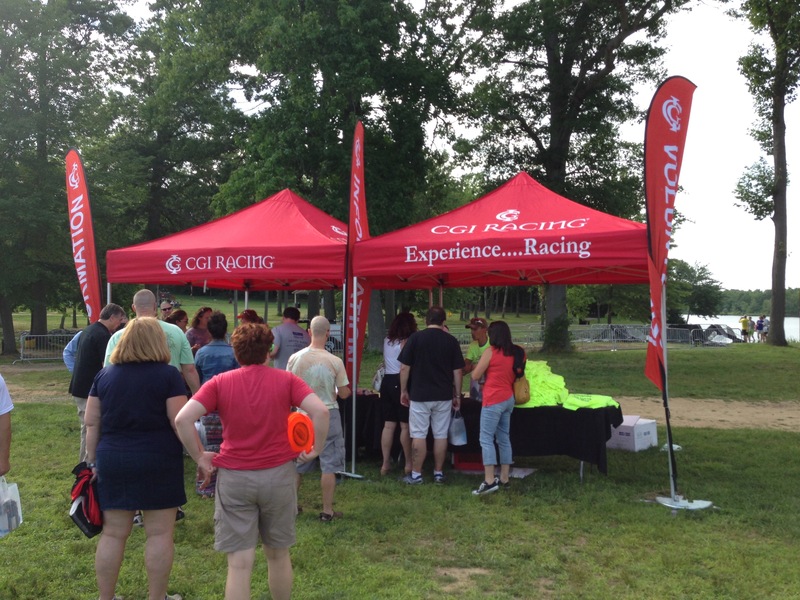 The expo was a few tents surrounding the packet pick up. It was small with a few vendors. 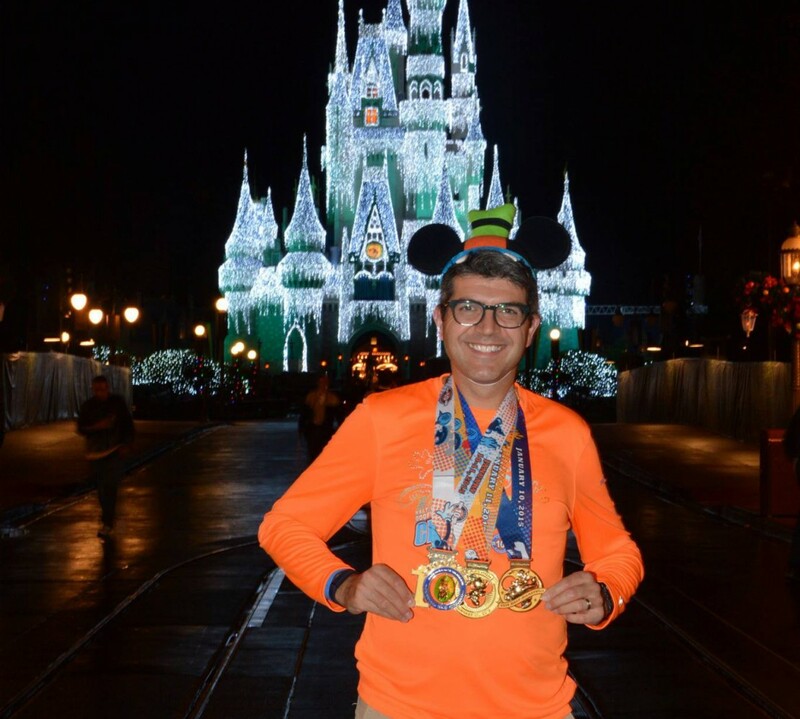 Once I had my packet and shirt and the volunteer had walked me through all the items in my race packet (including the ankle bracelet for the chip) I walked around in the order of the next day’s events. 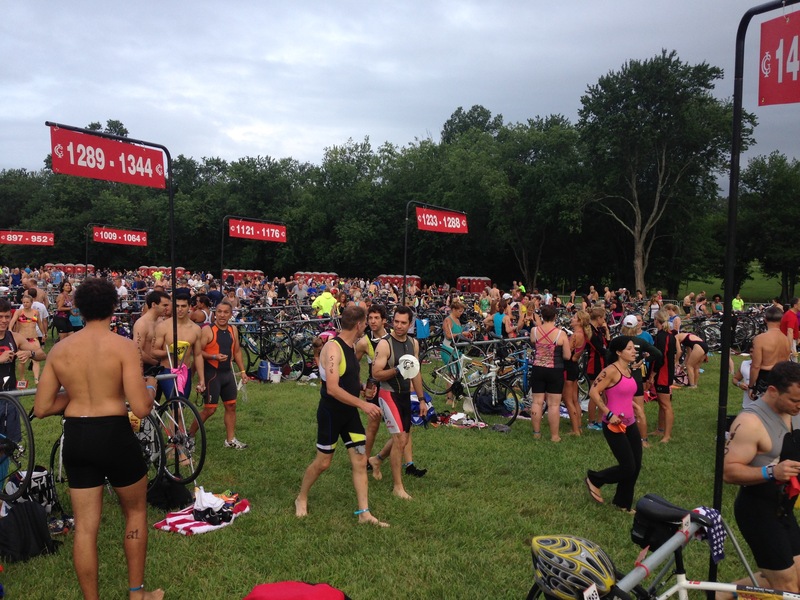 The swim, the bike and then the run. 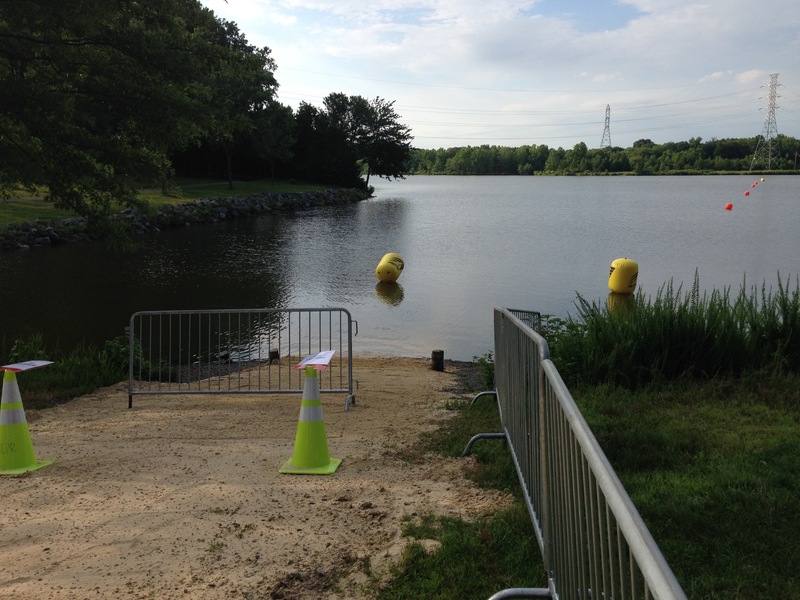 I walked down to the lake to see the entry point and the exit as well as to look out over the water along the course. 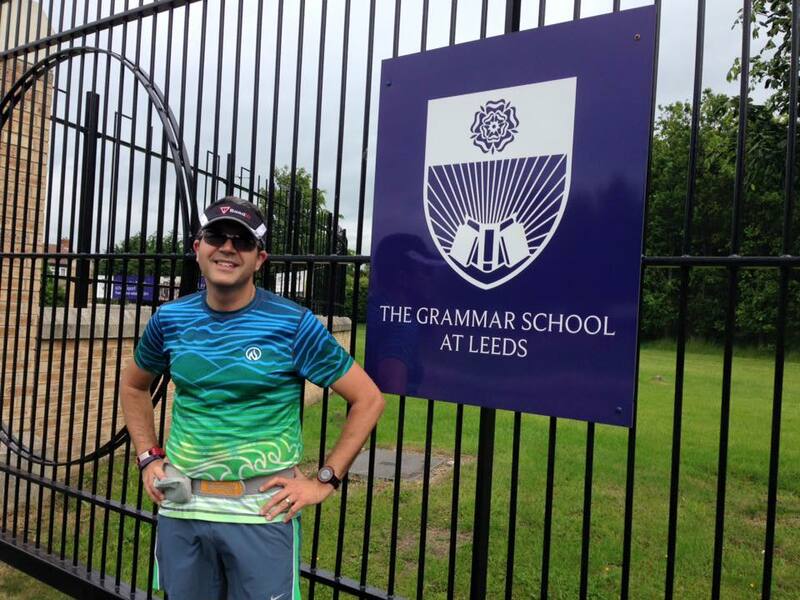 The first thing that struck me was that I wasn’t too intimidated by the course. 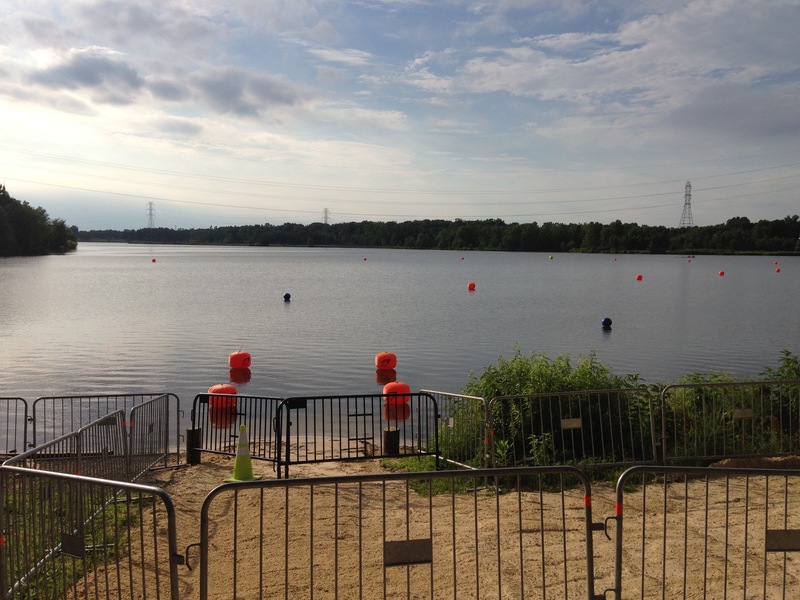 I wasn’t really sure in my mind how I would have pictured the swim as I’d only seen an Ironman competition on TV and not anything shorter and having only done lap swimming and no open water swimming before I didn’t really have a sense of the length. Yes…that will calm my nerves!!! So on entry to the transition area I went over to see where my bike would be set up the next day and to look for where I would be going both out and then in once I was transitioning. Worth checking where to head in advance so you don’t panic on the day. Walk up the chute out onto the road with the bike. This was both the out/in route for the bike portion. 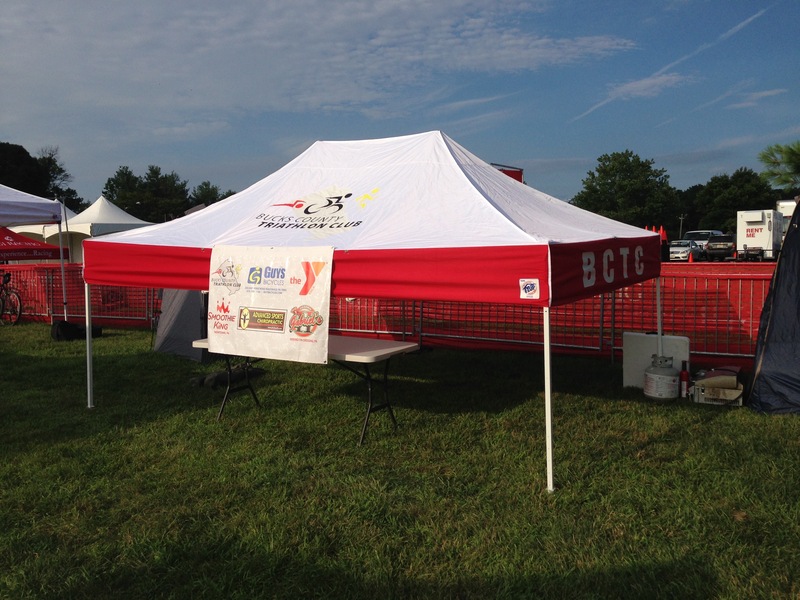 Having walked through the area I took a look at the VIP area as the Bucks County Triathlon Club had a team tent set up for the weekend. So with the packet picked up and the walk through completed I headed off to join the family for the evening. We were getting together by the pool to chill out with the boys for the evening. I was beginning to get a little antsy so I left early to start to get my gear ready for the next day. 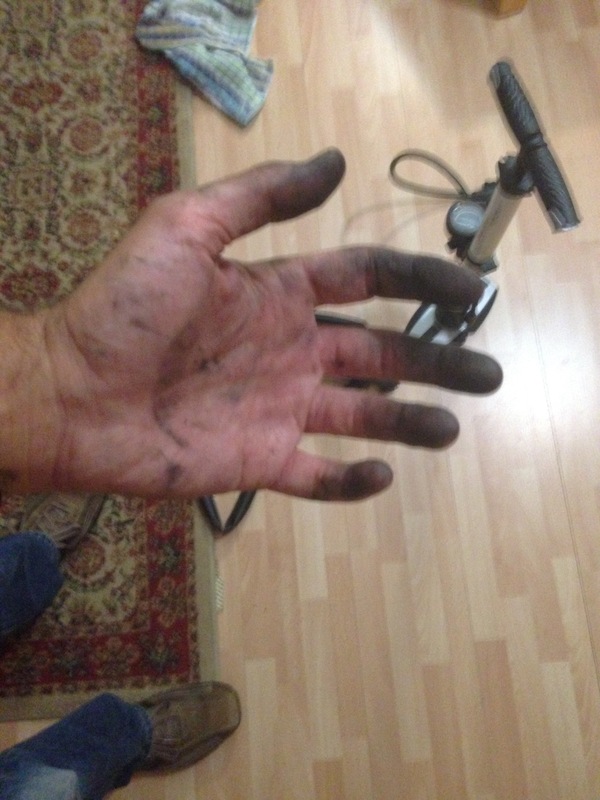 I needed to get my bike off the bike trainer and oil the chain and pump the tires. All was going well until….ssssssssss…what? What’s going on? sssssssss…. Yup, my rear wheel tube had split at the valve. 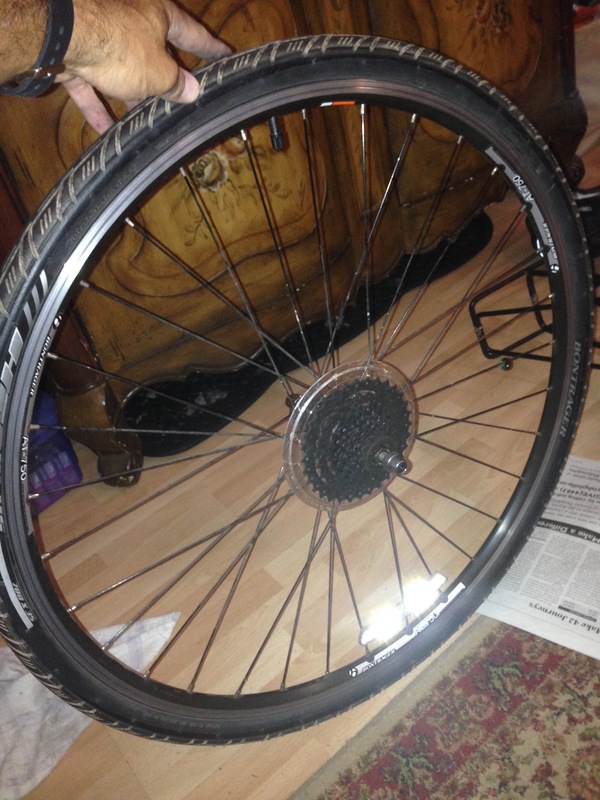 I have to admit that at 9:30pm the night before my first triathlon and having never changed a tire on a bike in my entire life I was a little freaked!!!! 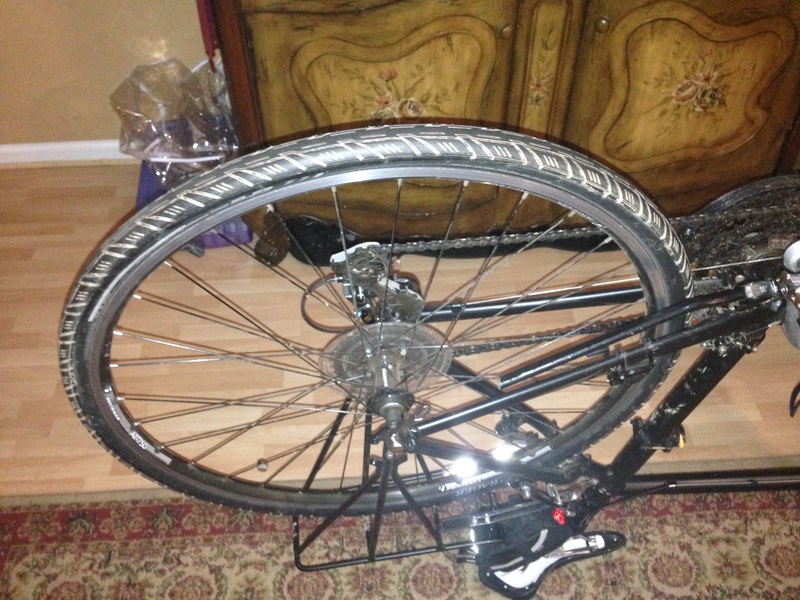 A few messages to biking friends and a post or two on Facebook groups guided me to YouTube. I must have watched the ‘How to change a tire’ video about a dozen times. 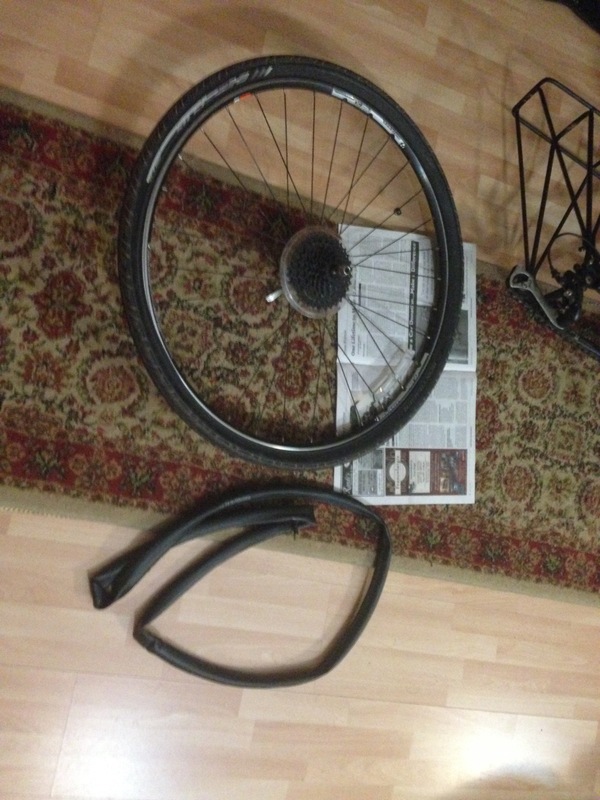 Ultimately…and messily I changed my tire tube. Luckily I had a spare. When I bought my bike they threw one into my gear bag. Never thought I’d use it though!!! Ultimately I got through this little last minute emergency and packed my bag ready for the next day. Finally ready for the big day. 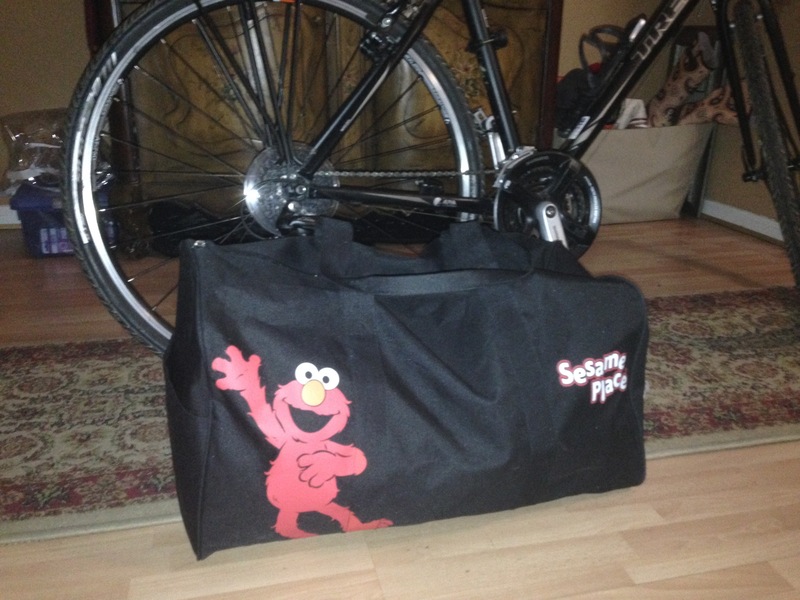 I bet no one else has a transition bag this cool!!! I didn’t get much sleep that night. Between the adrenaline rush of the bike incident and the thought of the swim and how I would handle the transition my mind was racing. I got about 4.5 hours of sleep. 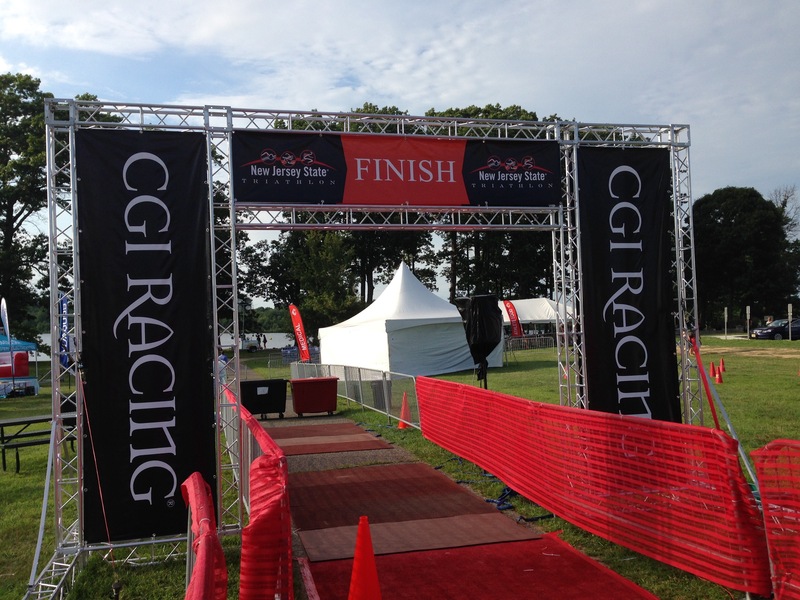 I got up around 4:15am with the goal of leaving home around 5-5:15am as it was a 30 minute drive to get to the race. I was a little tired but excited. 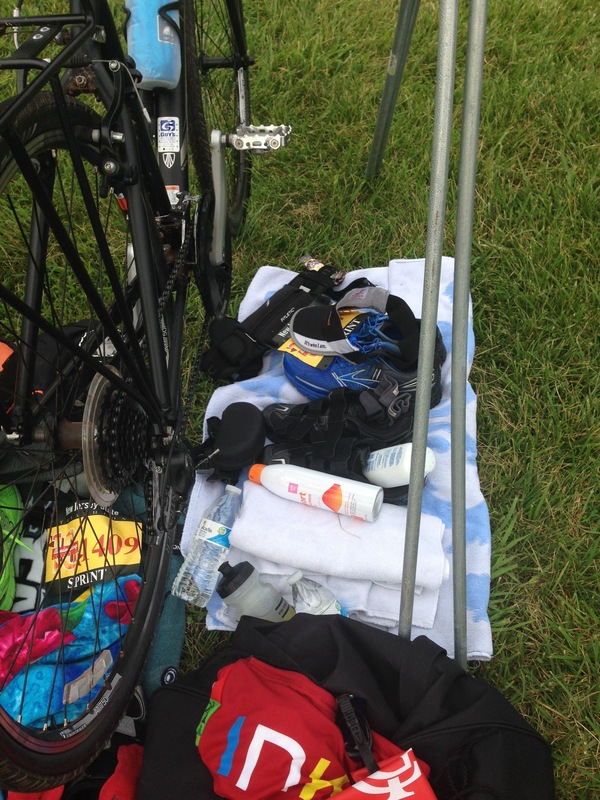 I had all my gear laid out the night before and I had my Powerbar and some water ready for when I was getting dressed. I had left random notes all over the house to remember my Garmin, to remember my water bottles in the refrigerator, etc. Packing the car and racking my bicycle in the dark was an interesting experience. Nevertheless I was all packed up and ready to go. I headed out to the race area. By the time I got to Mercer County Park there were plenty of people there. I parked next to a lady who looked like she was an experienced triathlete. 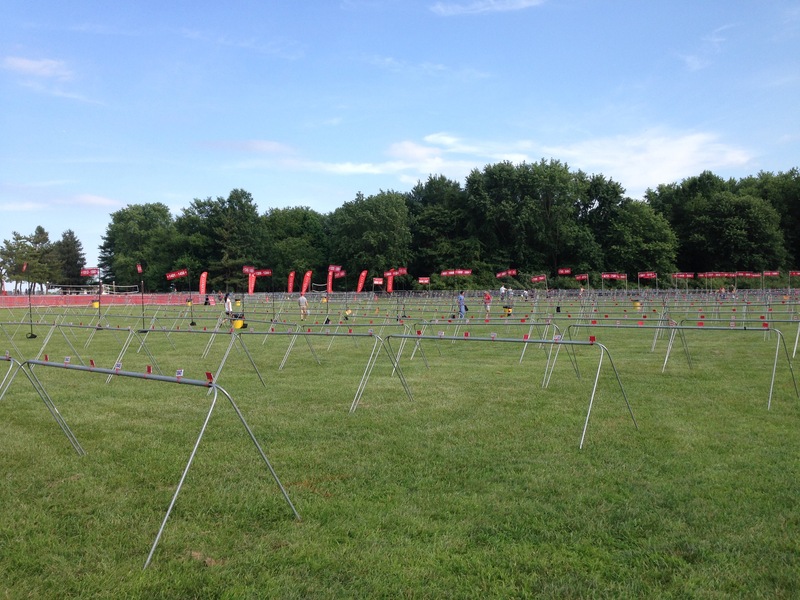 I nervously made small talk as we unpacked our cars and then made my way over to the transition area where volunteers were marking up everyone with their race numbers (number on each arm and age on one calf). 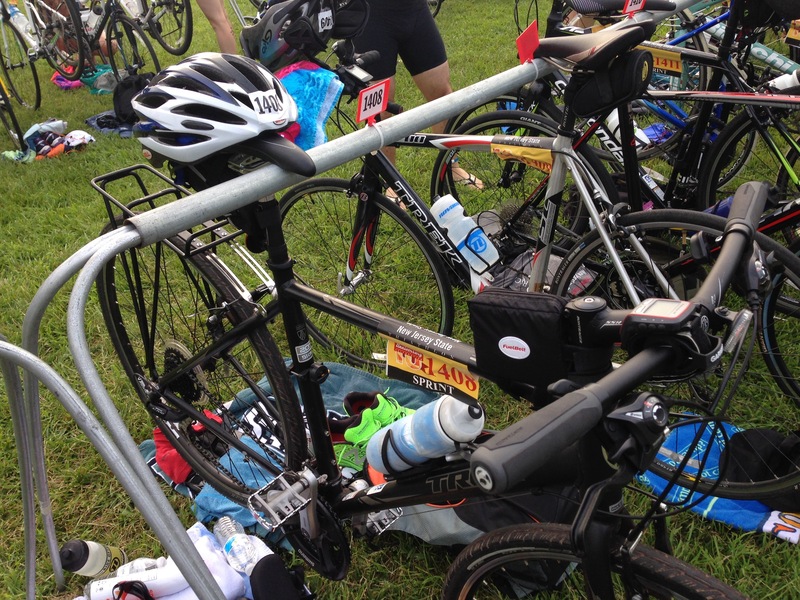 It was tight at the transition area as my neighbor seemed to have a lot of gear (well…a lot of space) and luckily I was at the end of the rack so I had a little extra space at the end to play with. I set up my gear and looked around at all the people there. I heard them announced the water temperature and they announced it was not wetsuit legal. 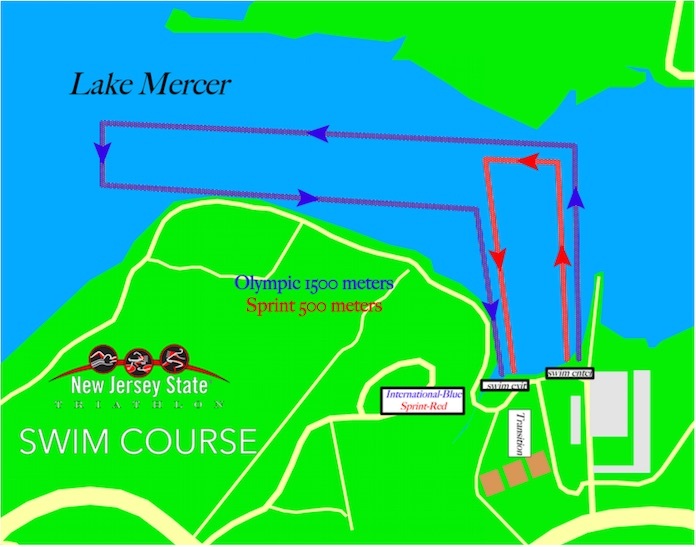 I had looked this up in advance and this time of year was typically very warm so I had not rented a wetsuit for this race. Glad I hadn’t spent the money at that moment. I made my way over to the port-a-potty’s and waited in line. The lines were not long but didn’t move fast. I figured it takes people so much extra time to get in and out of these tri-suits!!! I saw that people were being directed around the side of the boat house where they were allowed to do a practice swim. I hadn’t planned on it or given it any thought but I saw so many people going over there and it was almost an hour until my swim group went off that I decided to give it a try. 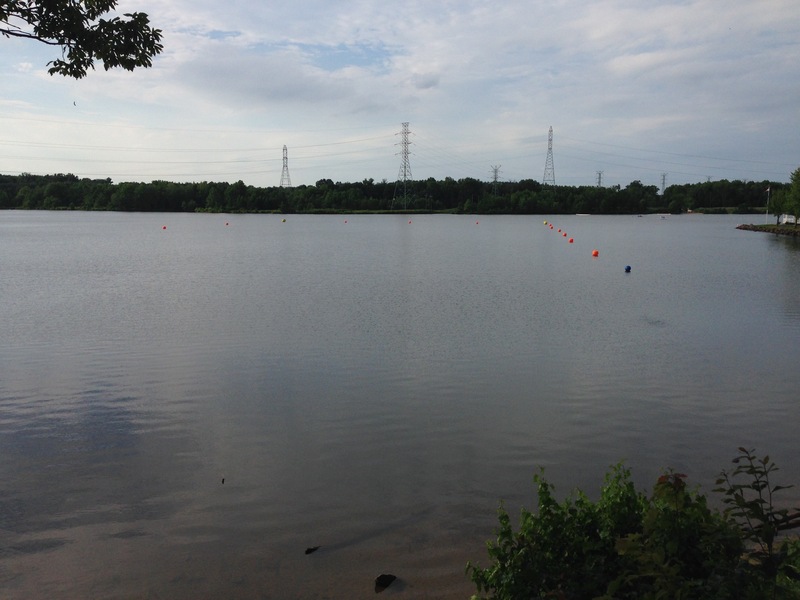 After all this would be my first open water swim. As I was walking down the ramp into the water I bumped into a colleague from work. We were both doing our first triathlon so it was nice to meet someone probably as anxious as me. I took my first steps (it was rocky) into the water and although I didn’t follow the whole practice course I swam for about 5 minutes out and back. Wow. You cannot see anything in the water!!! At least I now how an idea of what to expect for the real deal within the next hour. 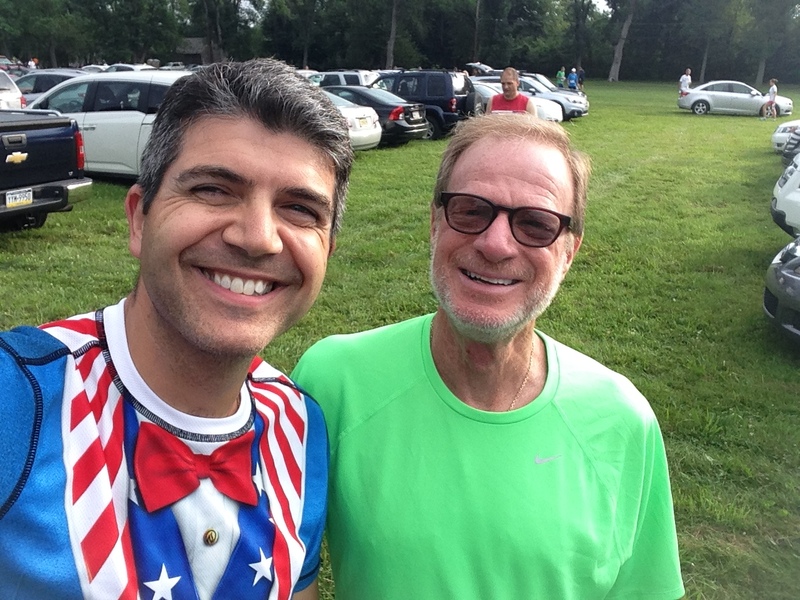 After exiting the water I bumped into a fellow Bucks County Tri-Club member and we chatted a little until I reconnected with my colleague. We hung out as the first few waves went off and he left about 10 minutes ahead of me and joined his wave. The swim started in the water so there was none of that mad dash into the water. That was good for me as I was worried about that at the start. I only pictured what I had seen on TV and those usually are the beach starts when everyone runs in at the same time. By starting in the water I could make sure I had enough space around me when I started swimming. I was given some advice before the swim which essentially was to wait for the gun (or the word to go), let the fast people go, count to ten then pick a spot and take my time going out. That would leave me a little behind everyone but out of the way of the main body of swimmers. Eventually my wave was called to the start. As we watched the previous wave go off everyone took their place and we went into the water. The temperature was comfortable and I felt remarkably relaxed at this point. I wasn’t racing anyone but just wanted to complete the swim without any major issues. I had plenty of space around me although I did line up towards the rear. Eventually our wave was released and we were off. Within the first 100 meters I was just focusing on staying calm and moving forward as I normally would with regular bilateral breathing every 3 strokes. 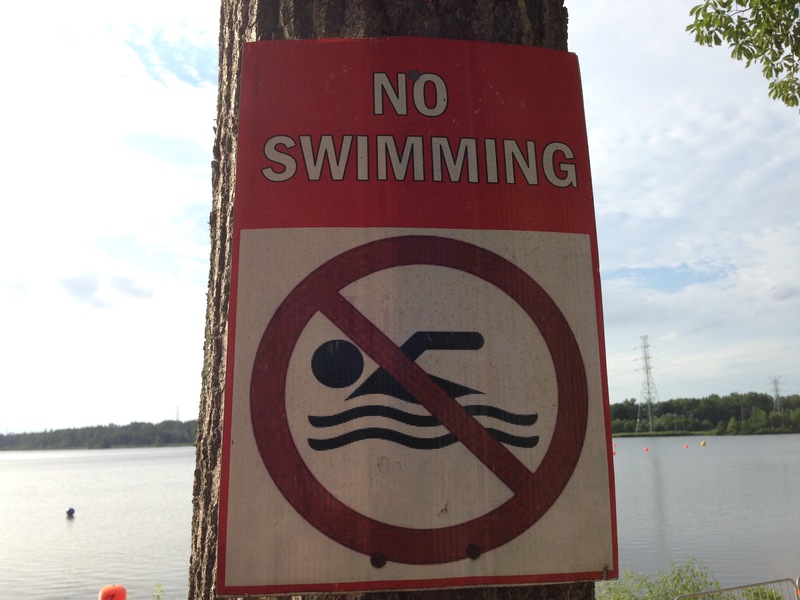 At one point however I came awfully close with a fellow swimmer and almost took a mouthful of lake water. Yuk! As started to cough a little and one of the race supervisors on a nearby kayak asked if I was okay. I gave him a thumbs up and then continued on my way. Next thing I know I’m being yelled at to go left by another person in a kayak and as I looked up I was veering almost off the course. After a couple of course corrections I eventually figured out how best to keep sighting while swimming and I made it around the first turn. I could hear another wave behind me be released as I was swimming. A little while after I made the second turn and headed in I was passed by the leader of the wave. I was swimming pretty steadily (mostly freestyle) and pretty much keeping a pace along with a bunch of other competitors and so I thought I was doing okay. 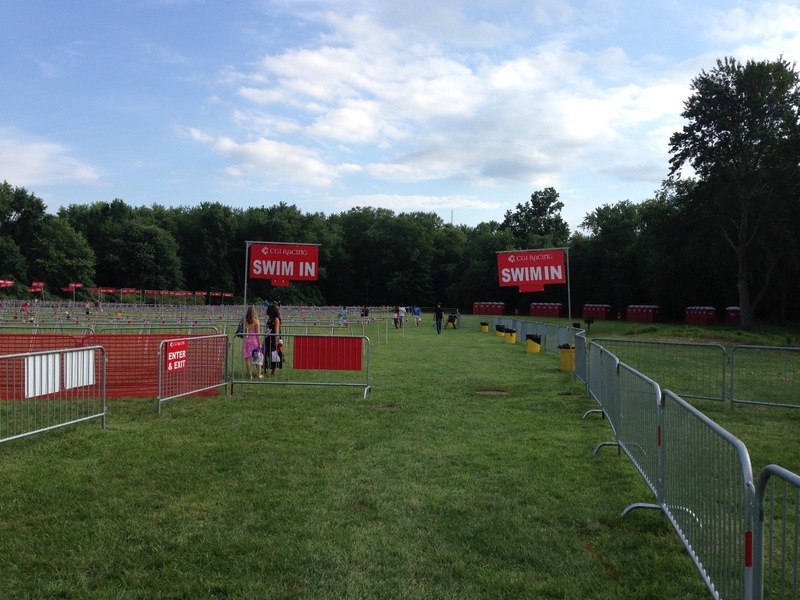 As I saw the exit approaching I focused on my form and made a beeline for the exit of the swim. As I made it to the shallow water I tried to stand up only to feel a little dizzy as I got upright. Luckily there was a volunteer in the water to catch me and hold my arm for a few moments until I could get my footing. 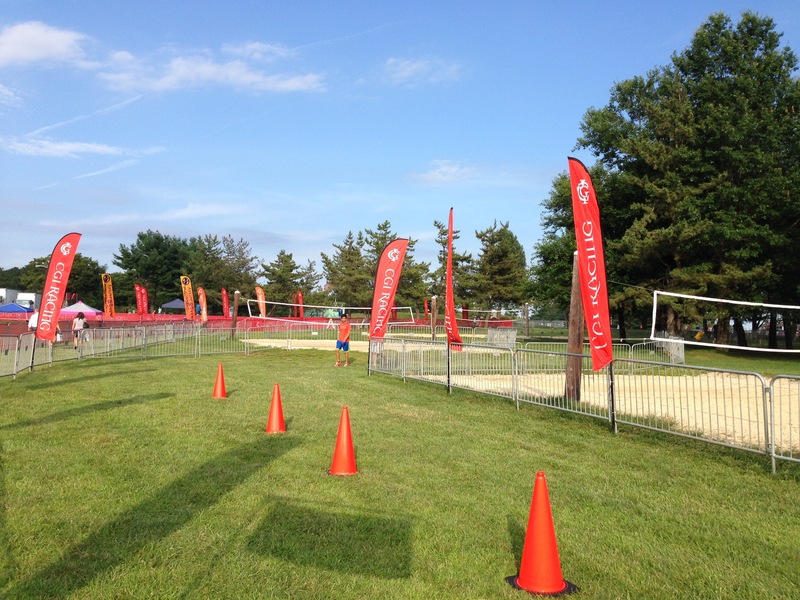 As soon as I was steady I made my way up the exit ramp and headed out towards the transition area. My one and only professional shot from the day – Exiting the swim. Proof I didn’t drown. I got into the transition area and made it to my bike. I had read a few tips about bringing extra bottles of water to wash sand/grass/dirt off your feet and this was a really good tip. 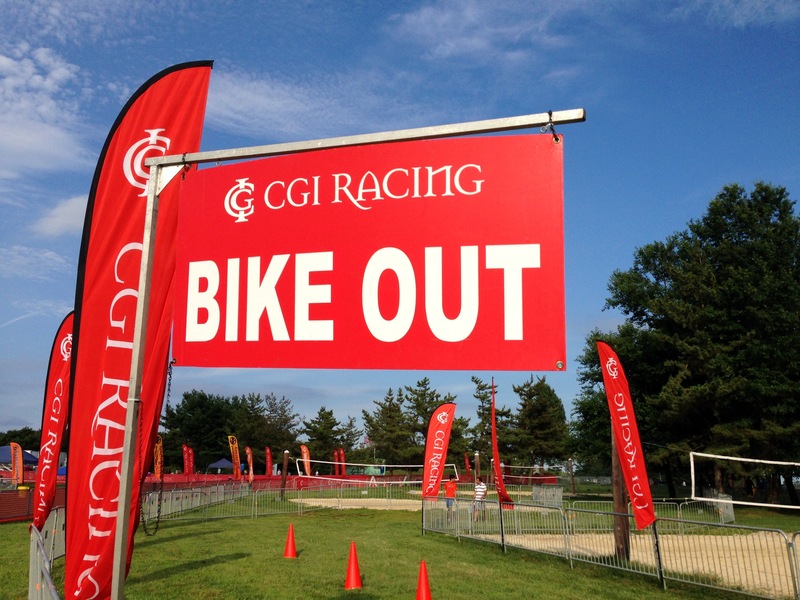 I dried my feet and put on some talc to help put on my Injini socks (not the easiest to put on in a rush), grabbed my bike shoes and helmet and made my way out of the transition area. Once we exited the grass area the volunteers told us to mount the bike after we crossed the red line which was the start of the bike course. As I set off on my bike the sky was getting really dark. They had mentioned that there was a chance of rain towards the end of the race so I was hoping it would hold off while on the bike. I don’t mind running in the rain (although not when it was like the LOVE Run Half Marathon type of rain LOL). 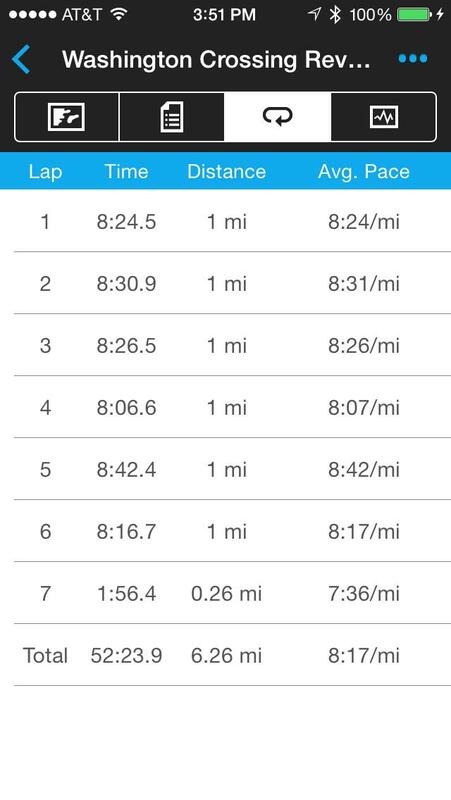 I started off steadily and used the first mile to get down some water and a Gu gel packet. 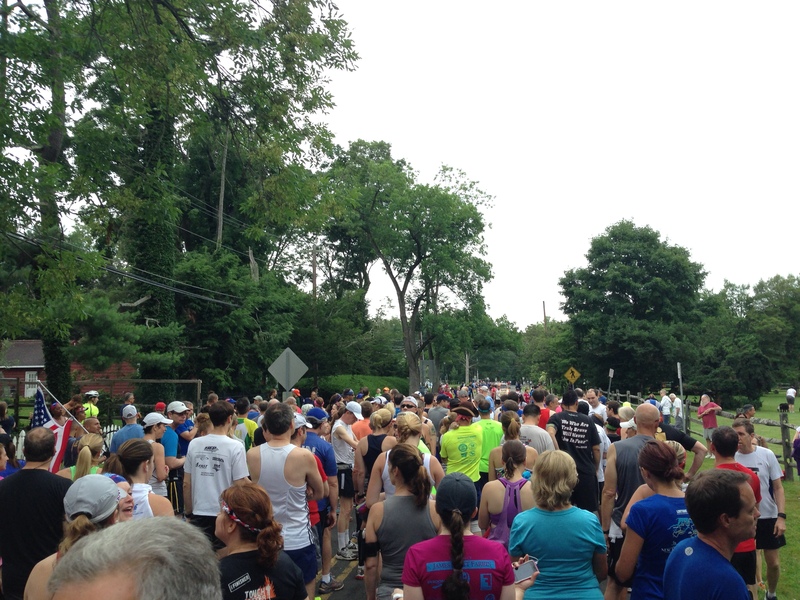 As I was progressing through mile 2 the rain started. Gently at first but by mile 3-4 it was steady and beginning to get harder. By mile 5 the rain was beating down hard and stinging my exposed skin. I started to see flashes of lightning and felt a little concerned about being out in a storm. I keep moving along (a decent pace for my hybrid bike) and despite the rain and the puddles was maintaining a consistent pace. I was however getting wet. Very wet. I could feel my socks squelching in my bike shoes and my bike helmet was not keeping my head dry from the elements. Interestingly there were a number of cars on the course as we were riding and some were not very considerate to the cyclists. There police were doing a great job at the road junctions but it was still a little hairy given the conditions at the moment. The rain was a downpour as I was approaching the last third of the bike route but I hadn’t seen any notification from the course volunteers and I hadn’t heard any siren or anything at this point. 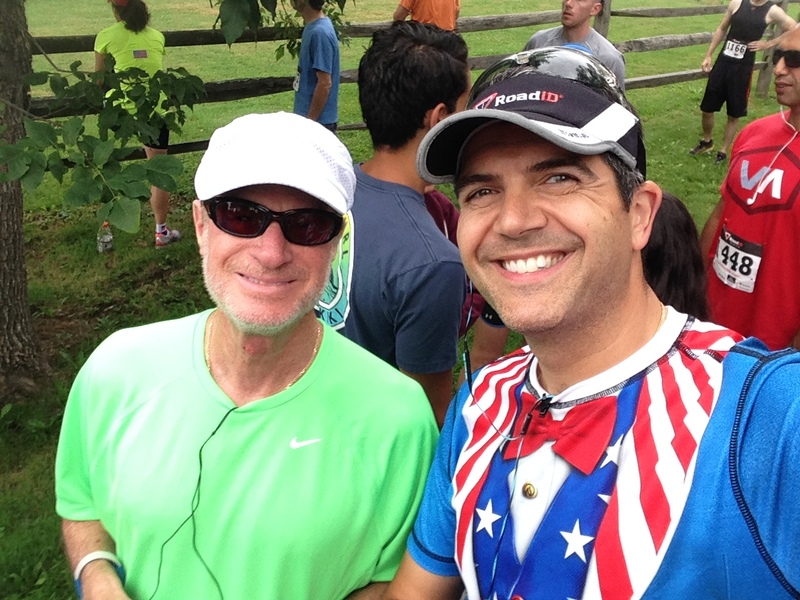 As I approached mile 10 the rain seemed to lighten up and I made my way back into the park. I was hoping that my shoes that I had left in the transition weren’t soaked but luckily I had another pair of shoes and a dry pair of socks in my bag (which hopefully wasn’t soaked itself). 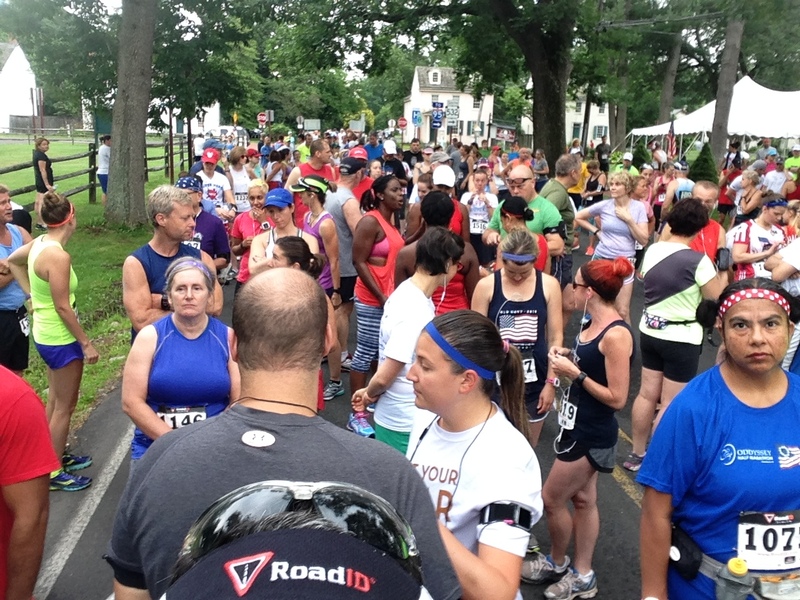 As I made my way to the transition area all of a sudden I started to see a whole bunch of folks walking on the side of the road ahead of me. I saw a few wearing medals so I just assumed these were the folks who had finished much faster than my wave. But then I heard a volunteer telling us to slow down and get off our bikes. 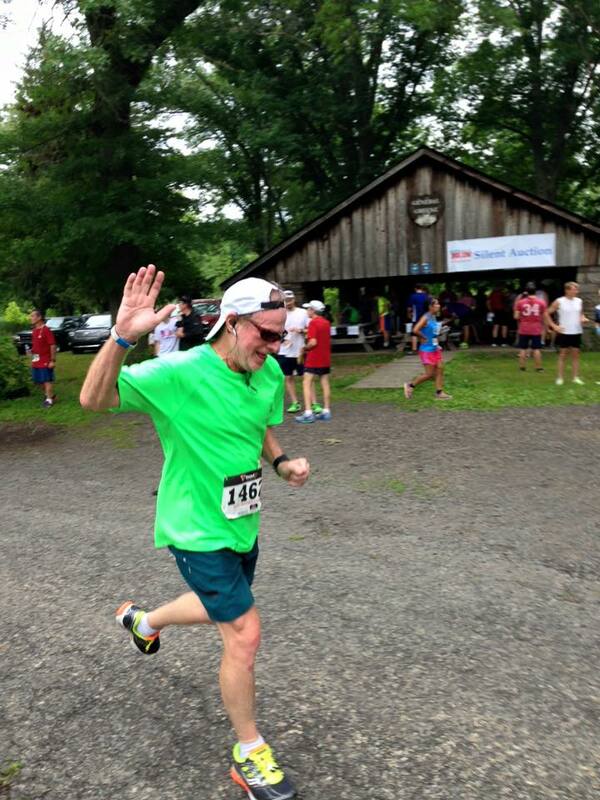 At this point I was at mile 10.9 of the 11.5 mile route. They told us that the race had been cancelled due to lightning. I was stunned. I wasn’t exactly sure what to do at that point. 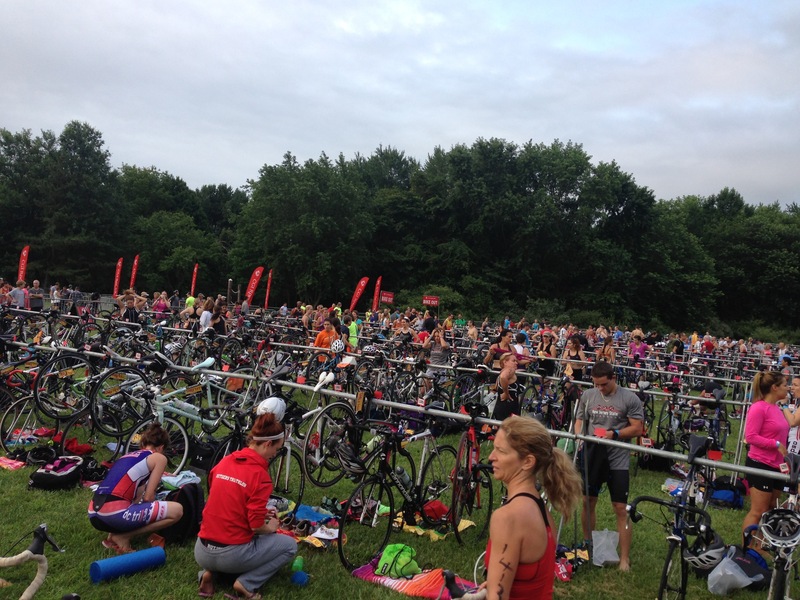 I got off my bike and started walking back to the transition area in a daze. As I walked my bike in I heard a member of the race organizing team shouting at everyone to get away from trees, metal and bikes as there was lightning in the area. They told us the transition area was closed and if we should go and sit in our cars until the storm had passed. As my keys were in the transition area I asked if I could get them and they said yes if I hurried. 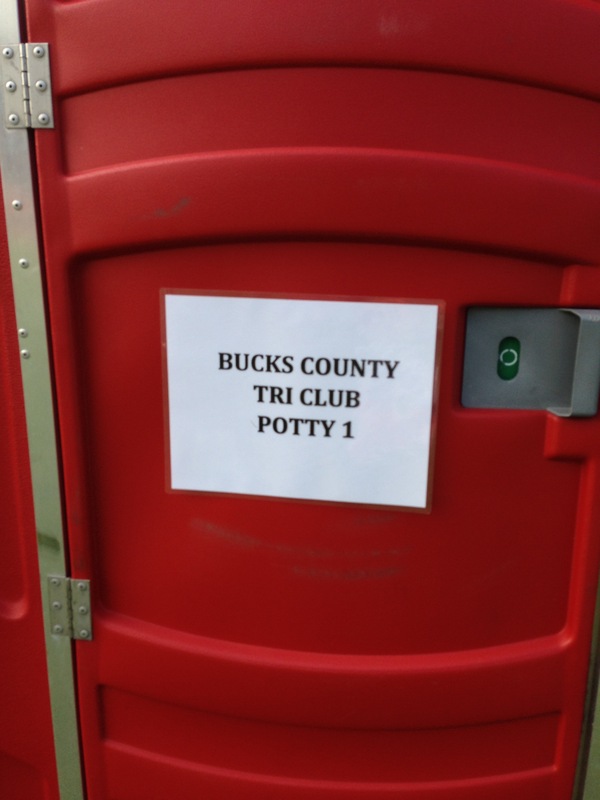 I saw a bunch of folks standing under the Bucks Country Tri Club tent and so I quickly ran up and left my bike there and then ran to the transition to grab my gear. Yes it was soaked. I quickly dashed back to stand under the tent with everyone else. I was totally at a loss for words. I felt I was doing great and I was so happy to have completed the swim but I just felt that I had had the stuffing knocked out of me. I was very disappointed. But not mad. What could I do? We waited under the tent until the storm passed. I wasn’t quite sure what to do. I noticed while I was standing under the tent that I had damaged my front brake…needless to say that was part of my tire changing experience from the night before so I decided to say goodbye to everyone and head over to my local bicycle store (Guy’s Bicycles) and have it checked out. As I was driving home I called my wife and told her how upset I was. She said it had been very dark but it had never rained at home. In fact the sun was out. I asked her if it would be alright if I went for a short run when I got home so I could get my mind clear and plan my next move and she was okay with that. She was disappointed for me too. 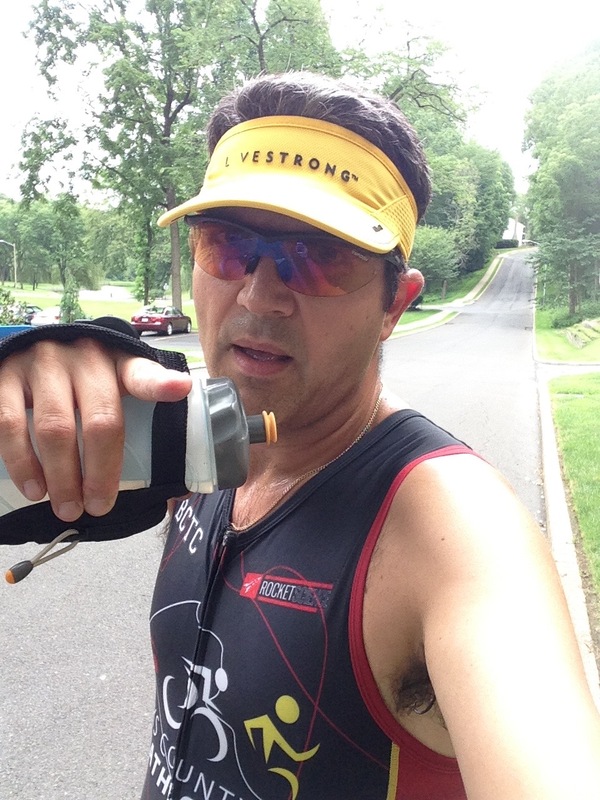 I was still dressed in my wet tri suit as I dropped off my bike but the sun was now shining again and so I quickly went home, changed my shoes and grabbed a hand-held water bottle as it was very hot by now and just went out and ran my 5K. That was pretty much all I had left to do to finish the triathlon. I must have looked a little silly running through the local park in a skin-tight suit all marked up with permanent marker on my arms and leg but I didn’t care. I was out and I was finishing my race my way. I took a long hot shower and hung my gear out to dry, stuffed my wet shoes with newspaper and came back to reality. I uploaded all my data after I’d had a chance to eat and relax and few hours to remove myself from the events of earlier in the day. Overall I cannot be that disappointed. 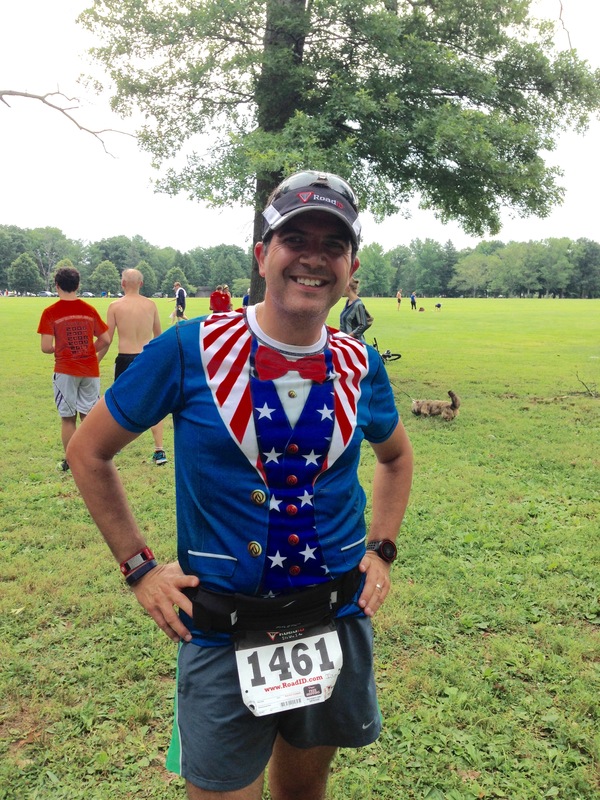 I didn’t quit, I didn’t DNF the race, the elements were out of my control. 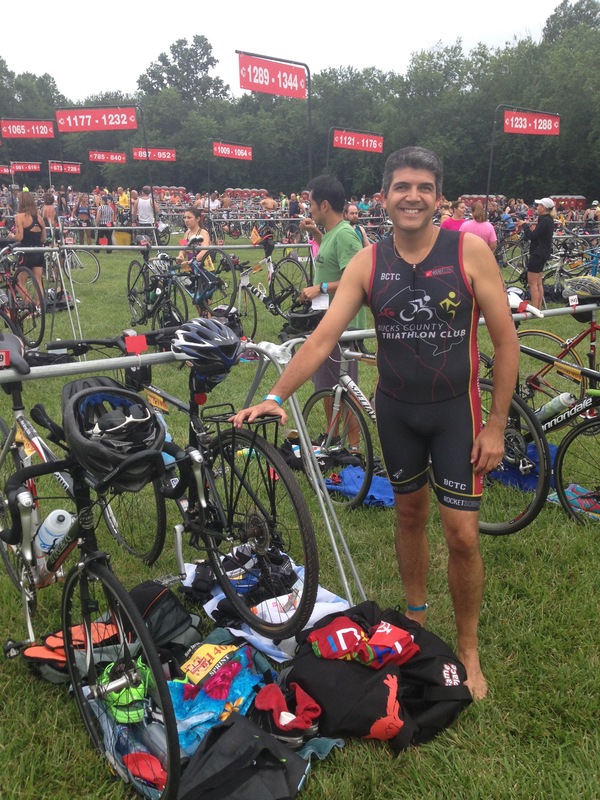 I was really pleased and proud to have completed the swim and the swim to bike transition. I learned a few lessons during that and also take away confidence that I can do this. Looking at my stats I did a triathlon on the day. I just did it my way and didn’t give up despite the situation. It would have been too easy to be down about the experience but by getting myself out for that 5K it turned a bad situation around and I know now that I can do this. 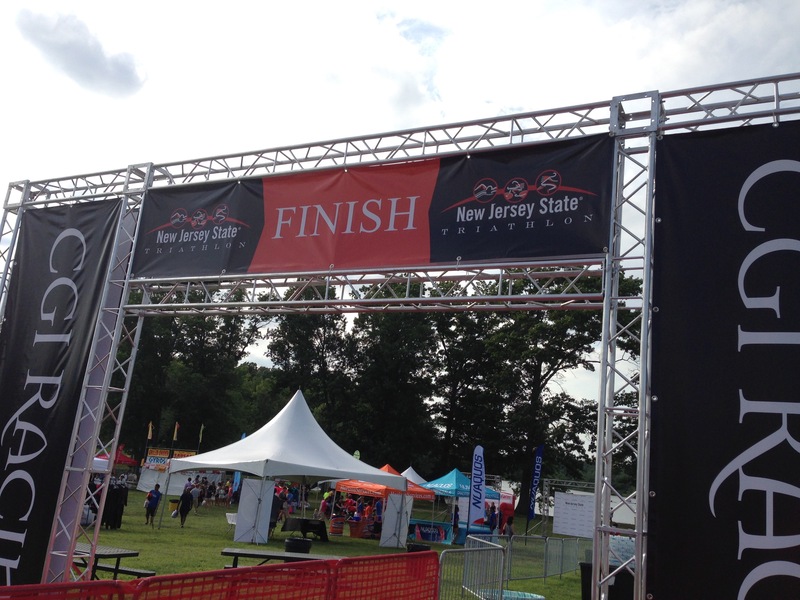 My goal for next year is to return to the New Jersey State Triathlon and do the Olympic distance as I had originally intended for this year. I am confident that I will do this now. I have committed to my swim training and will only get stronger and have more endurance in a years time. 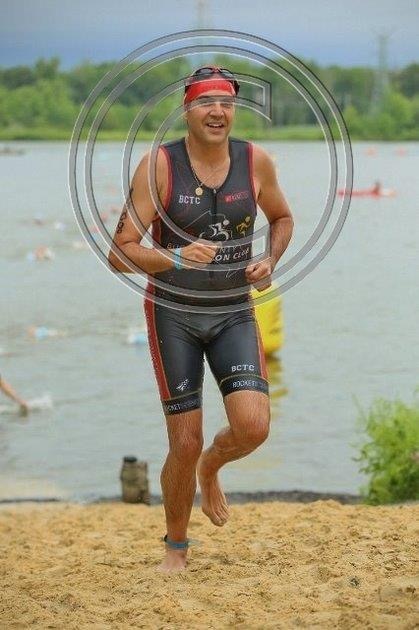 My next move was to find a local triathlon in the next few weeks to achieve my goal of completing a triathlon this season. I don’t want to wait another year. 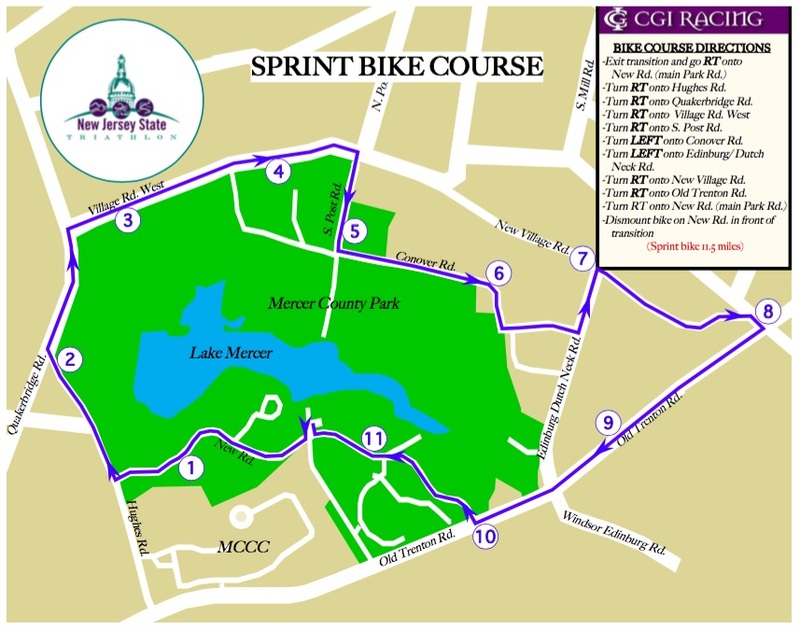 I took a look around and settled on the Medford Lakes Colony Sprint Triathlon on Sunday August 23rd. By the end of next month I will be a triathlete. 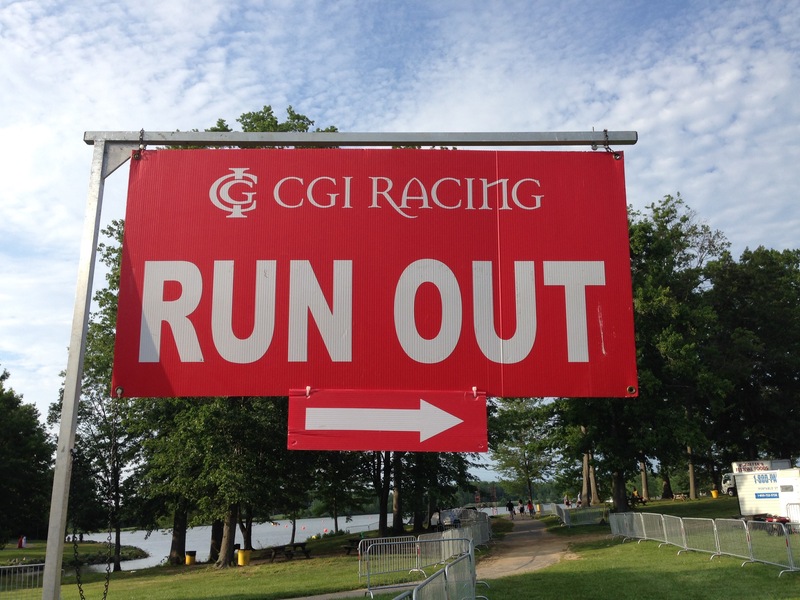 As a follow-up, the race organizers wrote to everyone and said “A decision will be made in the next few weeks on what will be offered to our Sprint athletes please be patient as we must first do our post race due diligence.” I will wait patiently. 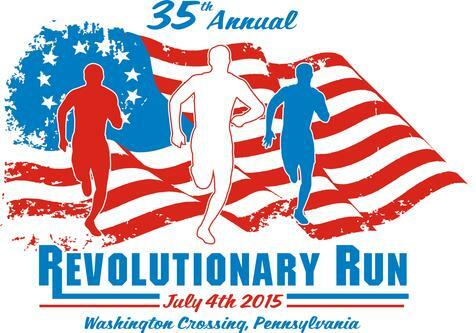 They also offered to send finisher medals to Sprint participants. I was not sure what to do. I usually display my race medals but I didn’t get a chance to finish this one. My wife says that after all the training and in completing the distance on the day I should take it but I don’t feel like I would want to display it. So what I have decided to do is to accept the medal, not display it but put it on the side with the goal of replacing it with the real deal in 2016. That will be my motivator. 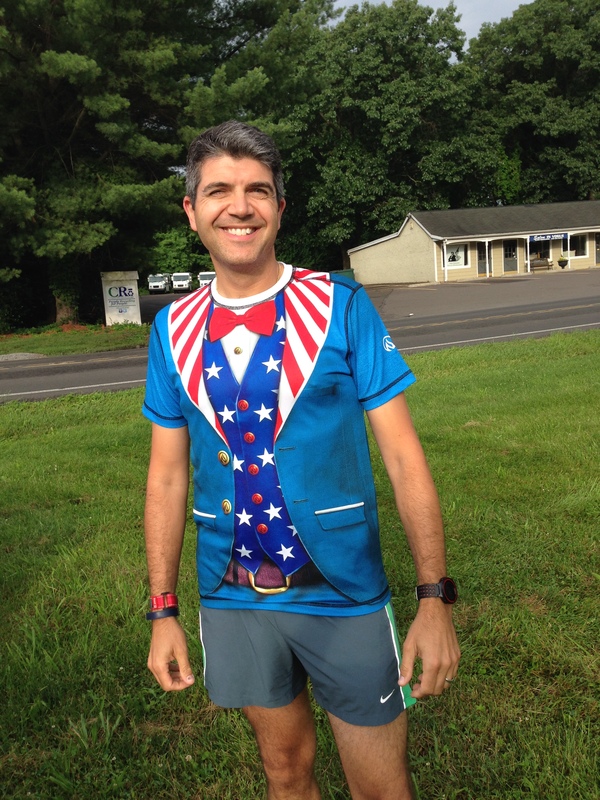 Once I have my 2016 New Jersey State Triathlon finisher medal I will donate the 2015 medal to ‘Medals 4 Mettle‘. That is my silver lining and my motivation for next years event. 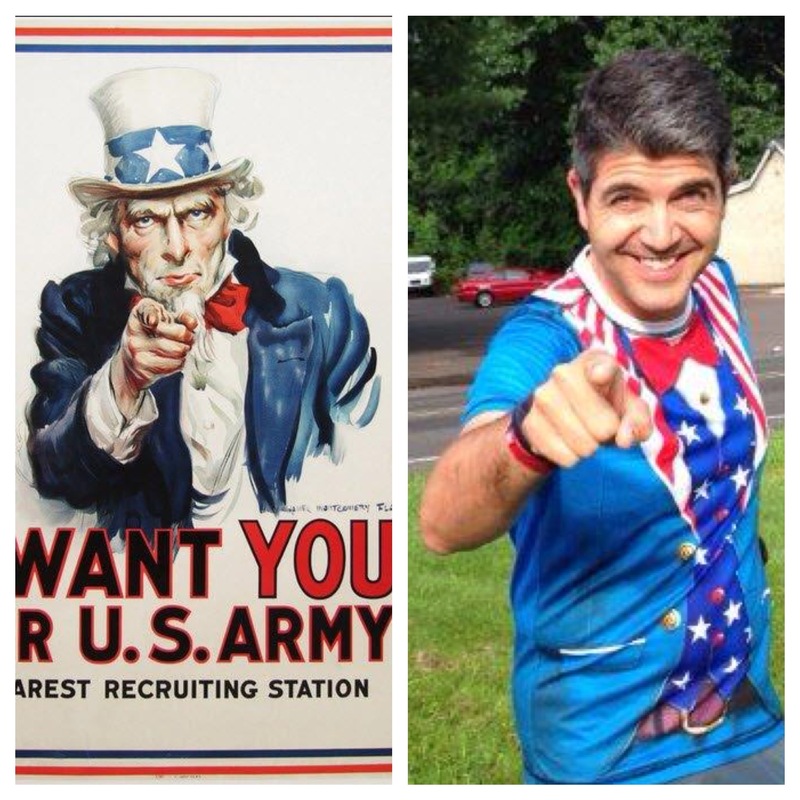 A little late but here goes my recap for my June 2015 activities. 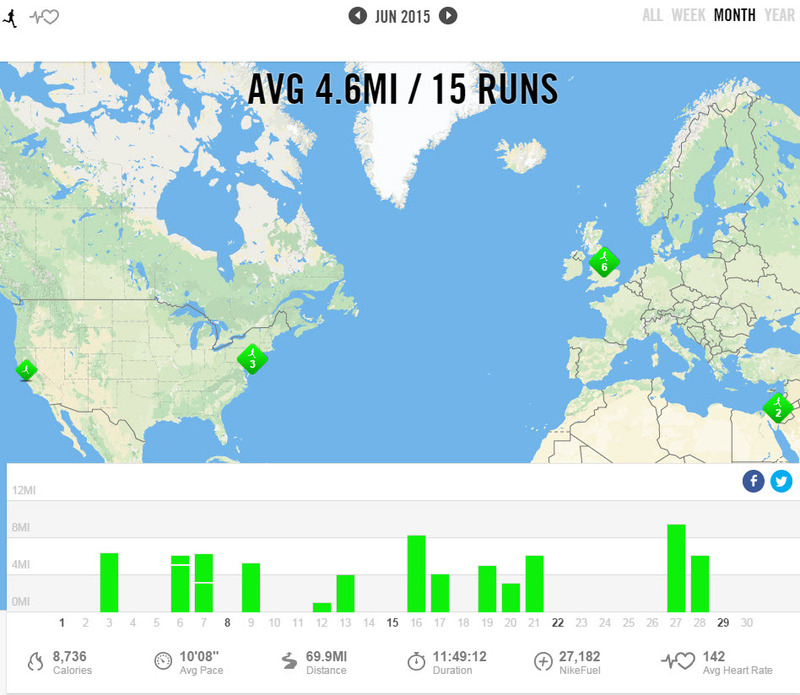 My Nike+ activity shows just under 70 miles run for the month. I may have to start moving away from sharing the monthly data from this platform going forward as it just shows running and none of the swimming and cycling I am currently doing in the run up to the New Jersey State Triathlon in July (my first triathlon). 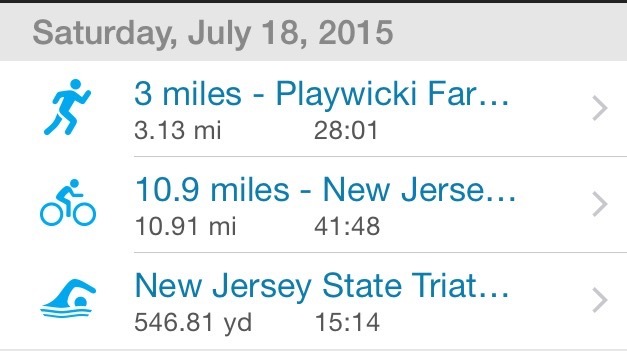 So here are my real stats (courtesy of Garmin/Map My Fitness). 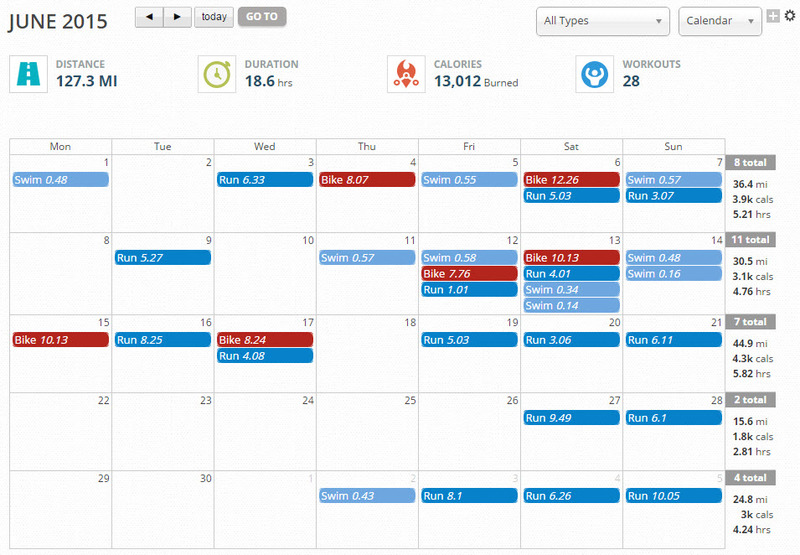 As you can see from the calendar there was quite a bit of swimming and cycling in the first half of the month. for a total of 127 miles (I don’t swim THAT far yet). 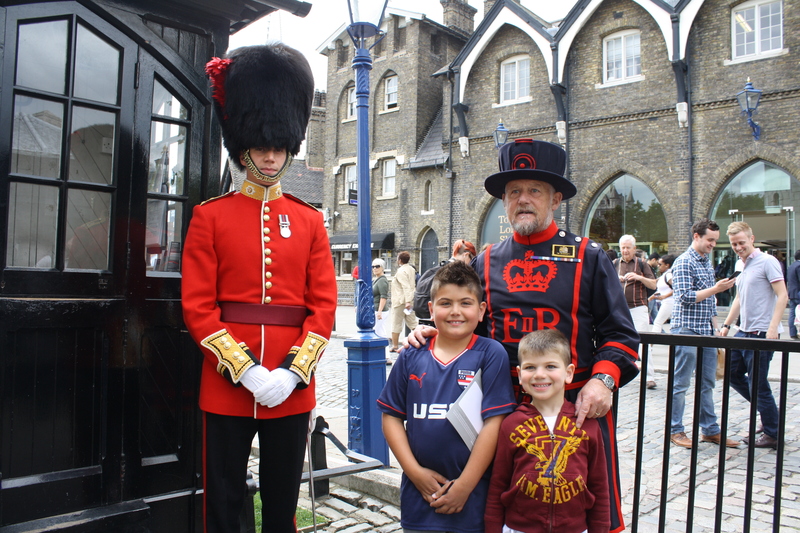 The reason the numbers look a little lower (other than focusing on the swim more) is that my family and I took a trip to the UK mid month and with a general focus on visiting my family and sightseeing with the boys we only managed to sneak in a few short runs during the trip. 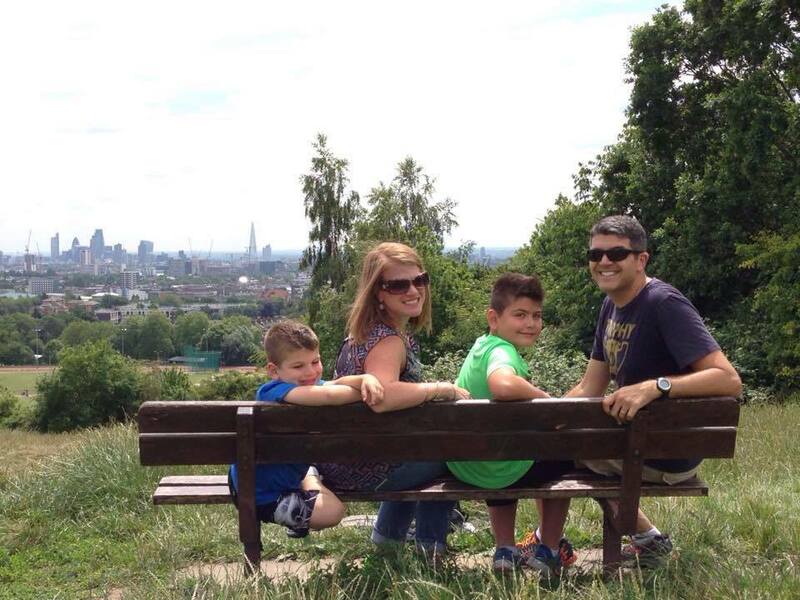 We took the boys to Parliament Hill in London to show them where we got engaged. 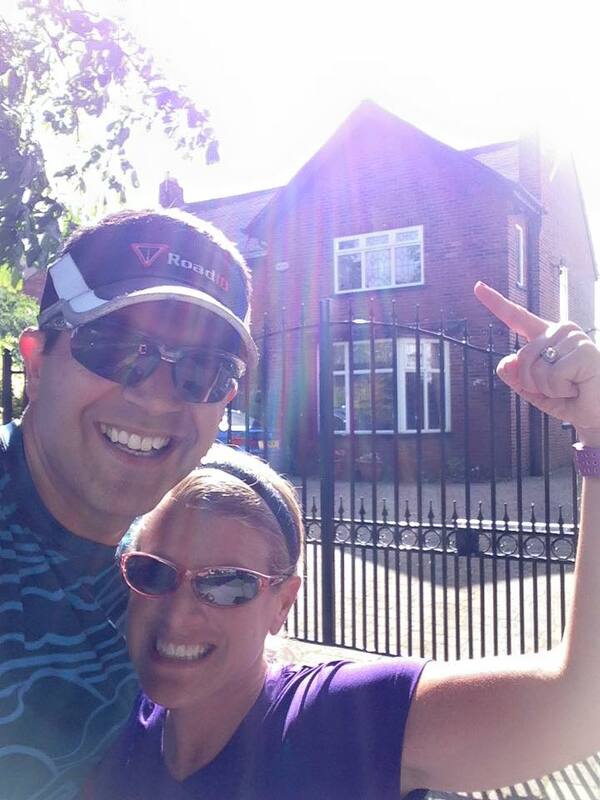 One of the highlights of the running on this trip was to take my wife on a tour of where I grew up and to visit (run by) old houses where I or my relatives lived as well as past the schools and friends houses around my old neighborhood. Good times. The house I grew up in. They put up gates…to keep me out? 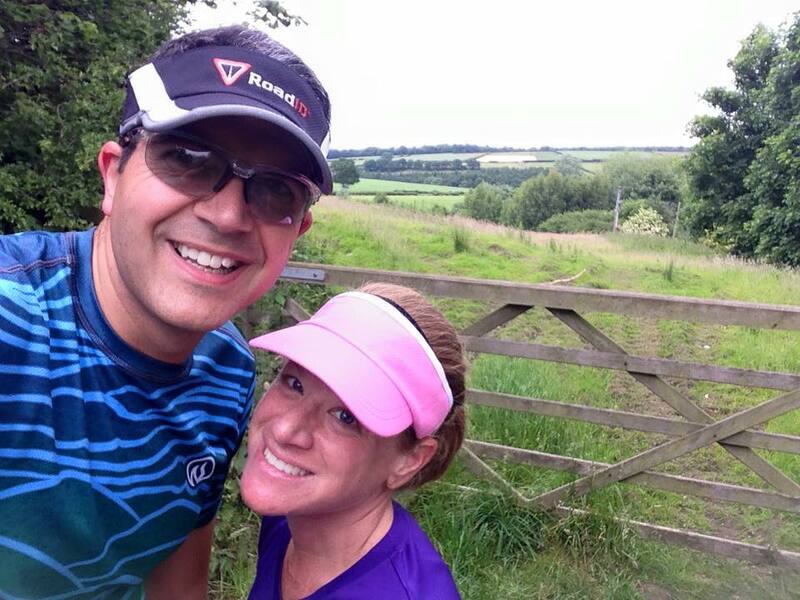 Wonderful running in the countryside near my old home. My old school (new campus built since I left). 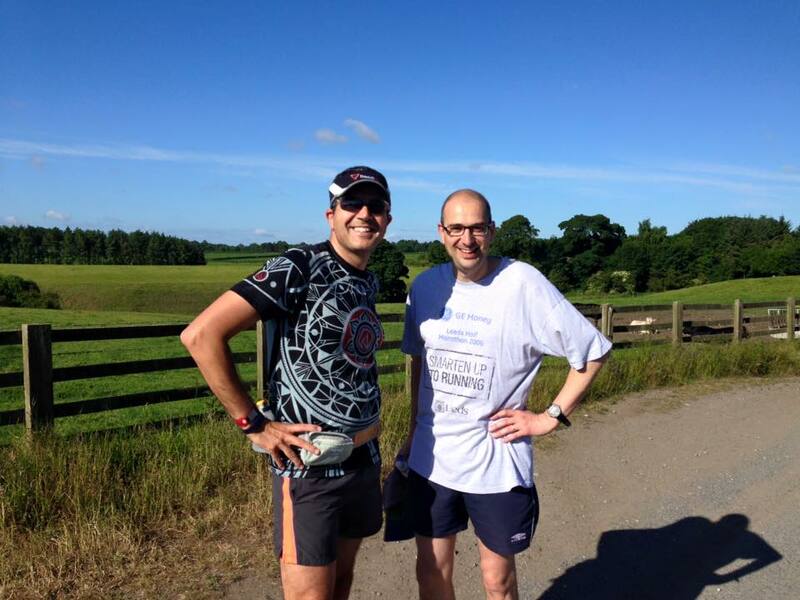 I also had the chance to catch up with many old friends during the visit and on one occasion a friend of mine (Michael) who had just completed the London Marathon invited us to run with him. This was great as I never would have ventured out on the route he took us. I haven’t lived in the UK for almost 14 years and not lived near where I grew up for almost 20 years so the guided tour was just what we needed. We were very fortunate that the weather was great while we were there (although I did pack a few long sleeve running shirts…just in case). Not that we were limited to these occasional runs while over there, as a family we walked and walked and walked all over London. 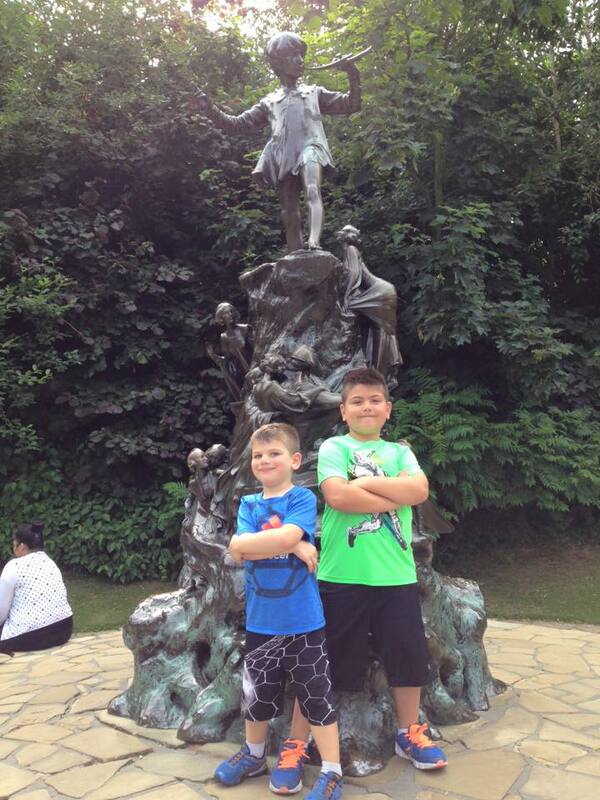 Both my 8 and 5-year-old boys kept up and didn’t complain once, even when my Fitbit told us we had walked 10 miles one of the days. A great visit back and I certainly ate more chocolate than I ever had in such a short time. 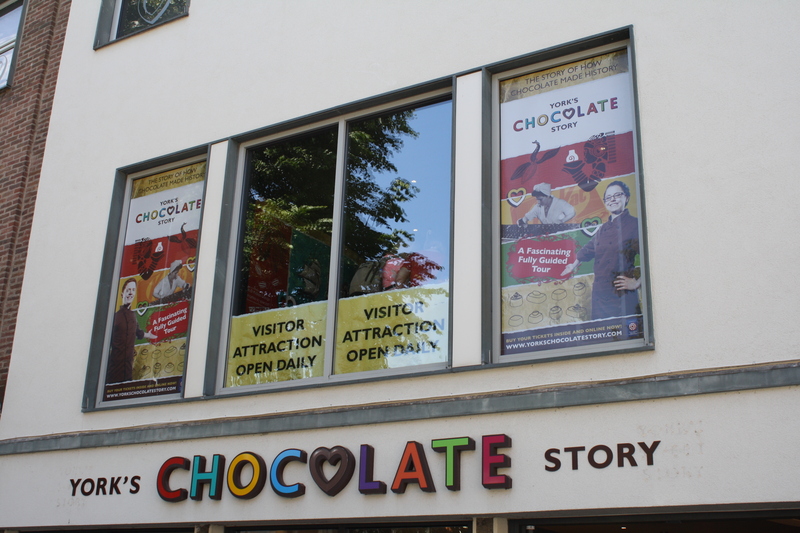 Well, we had to do the Chocolate Tour of York when we were there. We got back from what was a great trip on July 1st. I hadn’t been near a pool in 2 weeks and it showed on my first day back (although that may have been a combination of British chocolate and jet lag). Only a few weeks from the big day so lots of work still to do.